Science tells us that nothing in nature, not even the tiniest particle, can disappear without a trace. Think about that for a moment. Once you do, your thoughts about life will never the same. Ghosts want to be noticed. Ghosts have no sense of passing time. Often, they do not know that they are dead. Sometimes they exist in a state of confusion, perhaps like being stuck in a dream. Ghosts can smell things and love the smell of lemons. Ghosts have a sense of humor and love to hear humans laugh. Most ghosts are happy, but some still cling to an emotional pain. They can appear to the living in dreams. They can leave behind certain scents, such as perfume. They can make sounds that are audible. They use their energies and ours to move things. They usually appear as intense balls of light called orbs that are neon blue or violet. Ghosts favor night due to the decrease in daytime energy use. Ghosts may appear as mists or vapors. A hooded black smoky figure is a dark entity and you should be careful around them. They usually appear at the foot of beds. Some alleged hauntings are actually a “residue,” which is a past event that replays itself over and over. Certain places are portals or vortexes where ghosts transport themselves. Hauntings are most intense around children entering puberty, as kids this age are emitting immense amounts of energy. Ghosts can read your thoughts. Ghosts retain all the memories and emotions of their lives. Sometimes ghosts are trapped and need to be released. Let them know they can move on. Noisy, troublesome ghosts are known as poltergeists. Ghosts tend to be very temperamental. If a spirit was a jerk while living, they will probably still be a jerk while a ghost. Ghosts hang out in cliques with other ghosts. Ghosts make friends with other ghosts from different eras. If you hear a strange whisper in your ear when sleeping, it is probably a ghost. 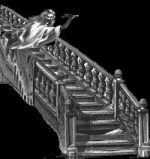 Ghosts like to climb up and down stairs at night. Most ghosts can’t or won’t hurt you. Animals can see or sense spirits, that’s why you often see them just staring intensely at what appears to be nothing. When a ghost enters a room, the room usually gets cold. Animal ghosts exist and have been sighted. Ghosts who lived hundreds of years ago keep up with the trends. Children perceive ghosts as imaginary friends. No one has ever come back from the other world. I can’t console you, but one thing I can tell you, as long as my ideas are alive, I will be alive. According to an expert in England, mobile phones are killing off ghosts. Tony Cornell of the Society for Psychical Research, told a British newspaper called the Sunday Express in 2001, that reports of ghost sightings began to decline when mobile phones were introduced. Apparently paranormal events, which some scientists put down to unusual electrical activity, could be drowned out by the electronic noise produced by phone calls and text messages.